I destroy, so I survive. 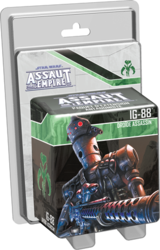 IG-88, Droid Assassin, shows ruthless efficiency in your Assault on the Empire! The "Droids Uprising" Project Card Series provides the Imperial player with unparalleled tactical options and a thrilling side mission that will fit into any campaign. This expansion also contains formidable Command cards, as well as two unique skirmish missions to play one on one.